mSPA® and mCHART® provide a one click integration to view pictures from Mirror. 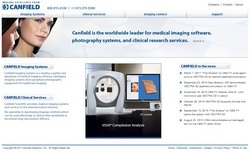 Canfield Imaging Systems is a leading supplier and developer of medical imaging software, intelligent imaging systems and specialized photographic equipment for healthcare imaging. Click image to open Canfield's website for more details on Mirror.